The last weekend in January and it's time for the Woodville Grand Prix where New Zealand's top motocross riders and generally a few overseas names come to play in the dirt. The day was a bit grey when we left Palmy and we even had to ride through some light rain and wet roads to get to Woodville. We timed it just right as when we arrived the rain disappeared and the first race began. I won't bore you with all the details (get a magazine) but it was good to see Darryl King clean up in the 250 class although he had a battle on his hand in the 500 races. Another highlight at Woodville is the river race where a creek is used as part of the track. Hard case seeing all the bikes disappearing in big splashes and then having to battle their way through holes etc with no visibility. 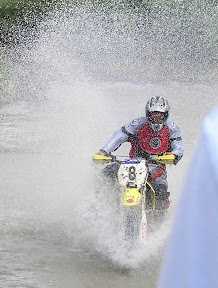 Both river races were won very convincingly by Paul Whibley - didn't get a picture of him through the tidal wave. All in all another good day sitting in the sun watching motorbikes being thrashed around a track and to top it off a quick blast of the Pahiatua Track to cool off a bit. A nice day again today in Palmy (forecast wrong again) so after doing some chores and walking the dog it seemed like a good idea to go for a blat. 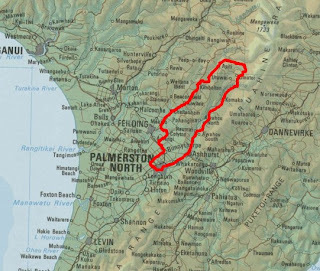 I decided that I was keen for a decent ride so picked the Pohangina Valley. I left home and headed on over through Colyton and then from Cheltenham on towards Apiti trying hard to keep the speed down on those big huge straights. Waved to a guy I know on a M109 going the other way. Doing this loop clockwise is always best as you get the boring stuff out of the way first before hitting some great winding roads towards Apiti and the nearly all the way back to Ashurst. A few sections of roadworks either side of Apiti but all signposted so no worries there. Only two surprises on the ride: 4 sheep on the road in one piece and then dropping into one corner and finding gravel all over the road. Coming up to the turnoff to Pohangina I started reeling in another guy and eventually caught him up just after Totara Reserve. He was riding one of the new Triumph twins and as soon as he saw me he nailed it. Had a bit of fun following him into Ashurst. Came back home through town hanging out for a big cold drink. A good little ride of about 150km taking approx an hour and a half. Hope the weather stays good - hoping to go across to Woodville for the motocross tomorrow. Well we're committed now - both Mark & I have sent away our entries to this year's Rusty Nut's Grand Challenge. Just got to organise leave etc. Neither of us is hard enough to go for the extra 500km extension, see earlier blog here. Better to pace ourselves and get the badge for the first 1600K's and not bend body or bike going hard to do 2100K's and get no badge. Of course before all this can happen we've got to get the Southern Cross out of the way. Can't wait. Some accommodation already booked, ferry crossing picked and a plan of attack worked out. Roll on April. 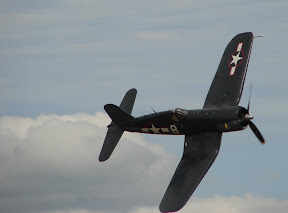 This weekend Wings Over Wairarapa was held at Hood Aerodrome, Masterton. A good excuse for a ride and the second time I've been to this event. Friends Brian & Linda didn't take much convincing either and Brian organised his brother's GSX-R for the ride. With the weather predicted to be good all weekend we decided that Sunday was the day. Trouble was the weather never does as it's supposed to and we got up to a pretty grey and drizzly day. We headed off into and stopped briefly in Woodville to have a cuppa with my folks in their camper. They had been to the show the day before and gave us a bit of an idea of what we were going to see. When we left them it was still raining and we were wondering what the weather would be like in Masterton. We shouldn't have worried as by the time we got south of Eketahuna the sun was starting to poke it's head out and we arrived to a nice but slightly cloudy day in Masterton. 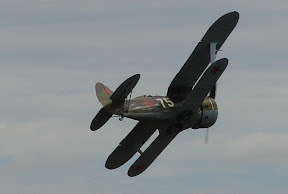 We also arrived to the sight of the Corsair and Polikarpov buzzing the aerodrome as well - a great welcome to the show. After a quick bite of lunch it was time to find a place to park our bums and watch the show. The show was great with something always happening. The only downer for me was the battery going flat in my camera with still plenty of show to go. Highlights for me were the WW1 aircraft, the Polikarpov, the airfield attack & defence and at the absolute top of the list the Mustang - you just can't get enough of that Merlin sound! See more of Brian's and my pictures here. Also, apparently there is at least 1 pre-production K7 Bandit in the country - need to keep a look out and see if it comes here so I can go for a perv. 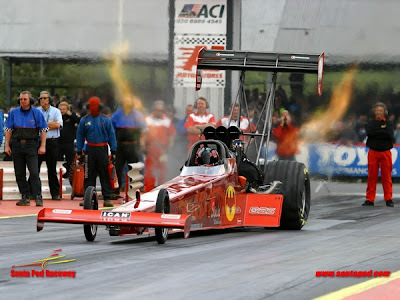 Got this in my email a while ago - an interesting article on Top Fuel Dragsters. Been a long time since I've seen some decent drag racing - always impressive! * One Top Fuel dragster 500 cubic inch Hemi engine makes more horsepower than the first 4 rows at the Indy. 500. * Under full throttle, a Top Fuel dragster engine consumes 1 gallons of nitromethane per second; a fully loaded 747 consumes jet fuel at the same rate with 25% less energy being produced. * A stock Dodge 426 Hemi V8 engine cannot produce enough power to drive the dragster's supercharger. * At the stoichiometric 1.7:1 air/fuel mixture for nitromethane the flame front temperature measures 7050 degrees F.
* Spark plug electrodes are totally consumed during a pass. After ½ way, the engine is dieseling from compression plus the glow of exhaust valves at 1400 degrees F. The engine can only be shut down by cutting the fuel flow. * In order to exceed 300 mph in 4.5 seconds dragsters must accelerate at an average of over 4G's. In order to reach 200 mph well before half-track, the launch acceleration approaches 8G's. * Including the burnout the engine must only survive 900 revolutions under load. * The red-line is actually quite high at 9500 rpm. elapsed time record is 4.441 seconds for the quarter mile (10/05/03, Tony Schumacher). The top speed record is 333.00 mph (533 km/h) as measured over the last 66' of the run, (09/28/03 Doug Kalitta). You are riding the average $250,000 Honda MotoGP bike. Over a mile up the road, a Top Fuel dragster is staged and ready to launch down a quarter mile strip as you pass. You have the advantage of a flying start. You run the RC211V hard up through the gears and blast across the starting line and past the dragster at an honest 200 mph (293 ft/sec). The 'tree' goes green for both of you at that moment. The dragster launches and starts after you. You keep your wrist cranked hard, but you hear an incredibly brutal whine that sears your eardrums and within 3 seconds the dragster catches and passes you. Think about it, from a standing start, the dragster had spotted you 200mph and not only caught, but nearly blasted you off the road when he passed you within a mere 1320 foot long race course. 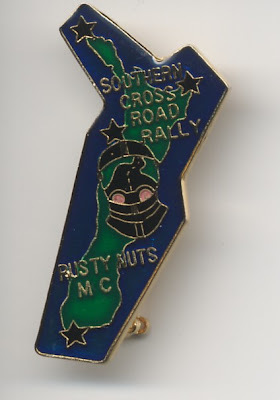 Got an email yesterday confirming that my entry into the 2007 Rusty Nut's Southern Cross has been accepted. Can't wait - it's been a long time since the 2005 one! Just got to finish up our plan of attack, book the ferry tickets and maybe some accomadation etc and we'll be set. Check out my story on the 2005 event here. 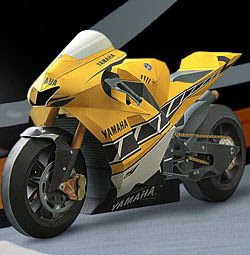 Check out the Yamaha site below with a number of paper models of their bikes that you can download, print and build. I've downloaded a couple and will see how I go. I've started with an R1 and it's not easy - I've nearly completed the front fairing - even this has taken about an hour and a half! Check out the photo of a finished one - not sure if mine will look that good. Christmas time generally means doing the family thing: catching up with rellies, swapping presents, eating etc. This Christmas (2006) meant going down to my sister’s in Nelson and meeting the newest member of the family – Baby Isla just 5 weeks old – and catching up with her big sister Caitlin (2). With Nelson being across the ditch and near some of the best bike riding roads in country naturally the bike was the only way to get down there. The bike would also have to double as a sleigh this time too so the luggage was packed to overflowing. With my mother already down in Nelson, the old man was keen to come down on his bike and bring her back on it (sick of propping up Air New Zealand). We had an early sailing (8:25) and because the boats were so heavily booked we had to be at the ferry terminal by 6:45am so this meant getting up early and hitting the road. We were gone by just before 5am with the weather playing ball for the meantime. But by the time we hit Shannon the clouds had opened up and it was raining quite heavily. 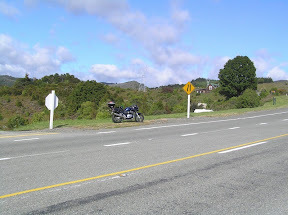 The old man decided that he didn’t want to hang around and get wet so we made pretty rapid progress from Shannon, past Levin and back onto highway one where we buttoned off to cruise on down the rest of the way. We got to the Ferry pretty early but only had to wait 5-10 mins before we got on. 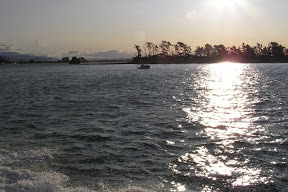 We then had to wait around for ages before the boat finally sailed about 10 mins late. Good crossing all the way and arrived to an absolute scorcher in Picton. Headed off around Queen Charlotte drive dodging the campers and cars and tried to keep cool. Stopped off in the Rai at my uncle’s for a quick catch up before tackling the Rai & Whangamoa Saddle – a great ride. After three days of Xmas celebrations, going to the beach, being lazy etc it was time for a day out on the bike. 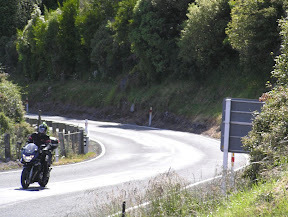 I’d never ridden the Takaka hill so was keen to head over there. Brother-in-law Dan tagged along on the back of Dad’s beemer and off we went. Lots of traffic all the way over to Mot – beautiful day and everyone heading for the beach but it thinned out a bit once we hit the hill proper. I took off up the hill and had an absolute blast. I stopped at what I thought was the summit and quickly stripped off my helmet and grabbed my camera to see if I could snap a shot of the BM coming up around the corner. Unfortunately they’d been held up by some cars and when they went past were passing a line of cars so I couldn’t get a clear shot of them. Quickly snapped off a pick of the Bandit at the top of the hill before tearing off after them. I caught them just as they pulling up at another viewing area just down the other side of the hill a bit. I stopped there and Dad tried to get a few photos of me blasting up and down the hill. Not too successful but he got one decent one. Once we hit Takaka we headed out around the Coast to Pohara for a coffee and a couple of photos before heading onto Collingwood where we stopped off for lunch. 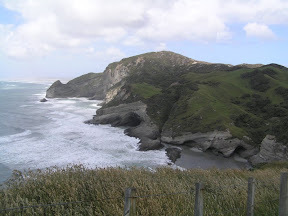 From Collingwood we headed off basically to the end of the road at Cape Farewell. We walked up the track to take some pictures and watch the seals play in the surf (could not get a photo – too hard to pick the seals up in the surf through the viewfinder). Sweated it up big time walking up the hill in bike gear but view was worth it. Unfortunately it was a bit too hazy to be able to see right out the spit to the lighthouse. Back on the bikes again, (mind the lady in the car taking to the one lane bridge when we were half way along it) through Collingwood & Takaka before hitting the hill again. We just got started up the hill when we were stopped due to a truck breaking down on the tightest bend on the road. Had to wait while they let some traffic down the hill before we could go on. This turned out to be good news as I was at the head of the queue and the delay had meant that any cars up ahead could get ahead and I’d have a pretty clear run up the hill. It worked a treat and I didn’t catch my first car until about three quarters of the way up to the summit. An even better ride going this direction! I waited at the turn off to Kaiteriteri for the others and we cruised down to the beach for petrol and an icecream. As expected the beach was packed out – everyone enjoying sun, sand and sea. Very quiet ride in heavy traffic back to Richmond. Excellent ride – around 340-350 k’s and several litres of sweat all told. Topped off the day by going for a quick blast in another rellie’s 27 foot launch on Nelson Harbour. Not a bad way to spend the day. Time to hit the road again and head back to Picton for the boat back North. This time with even more gear on the bikes and mum on the back of the BM. 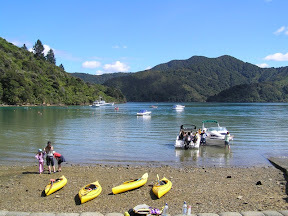 Had a very quiet ride over to Picton: stopped off in the Rai again and once around Queen Charlotte drive before having a coffee and boarding the boat. Went on with about 3 other bikes including an old R80GS with about 200,000 miles on it all loaded up. Another perfect sailing although the weather started packing up as we came into Wellington harbour. Left the boat and headed out into the rain and promptly got held up by some sort of accident in the Ngauranga gorge. It fined up pretty quickly and we ended up catching the old BM up just south of Levin. The rider was pushing her along pretty well even with a pack on his back but had to stop for gas at Shannon so we carried on without him. All told a total trip of about 920k’s.